Taco’s "MPT" product line offering incorporates the features of Taco's Buffer Tank, 5900 and standard in-line Air Separator product lines within a single product. This product line offers tank sizes ranging between 50 and 1050 gallons. They are available with a wide range of nozzle sizes across this product line. Each MPT model utilizes four nozzles, a full port blow down valve and Air Vent. These ASME tanks have been designed to 125 psi @ 240 degrees F. as standard. Should higher working pressures or temperatures be required, custom designs are available. 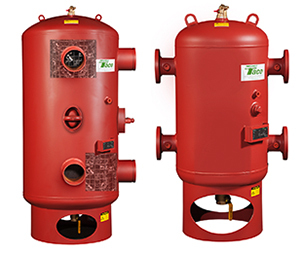 Each of these tank models are available with (4) system connections— two on each side of the tank located in both high and low positions to meet a wide range of application requirements. Other options include 1/2" Armaflex insulation for chilled water applications, 1" Silicon/fiberglass jacketed insulation for heating applications and 3/4" NPT connections on each nozzle for temperature/pressure ports and another port located in the center of the tank for mixed sensing.